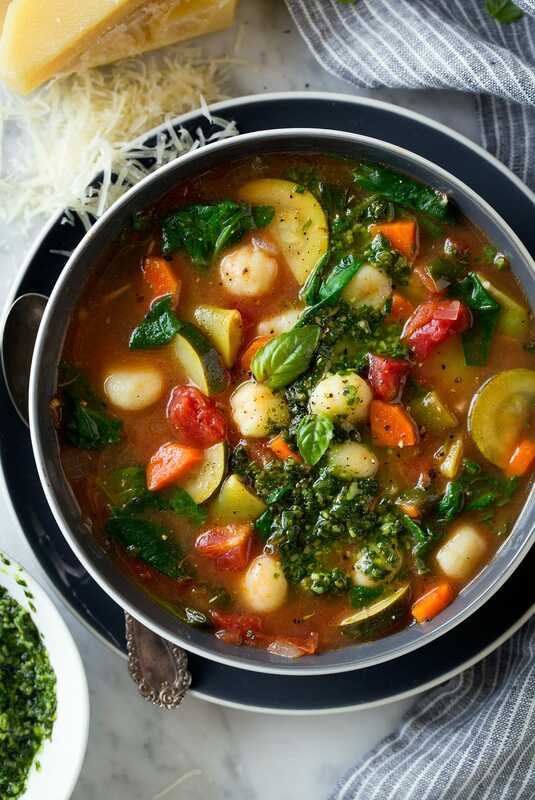 Gnocchi Vegetable Soup with Pesto and Parmesan is here to save the bitter cold day! 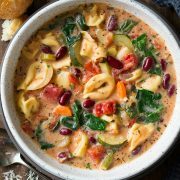 It’s healthy, hearty comfort food that’s boasting with fresh flavor and sure to satisfy! 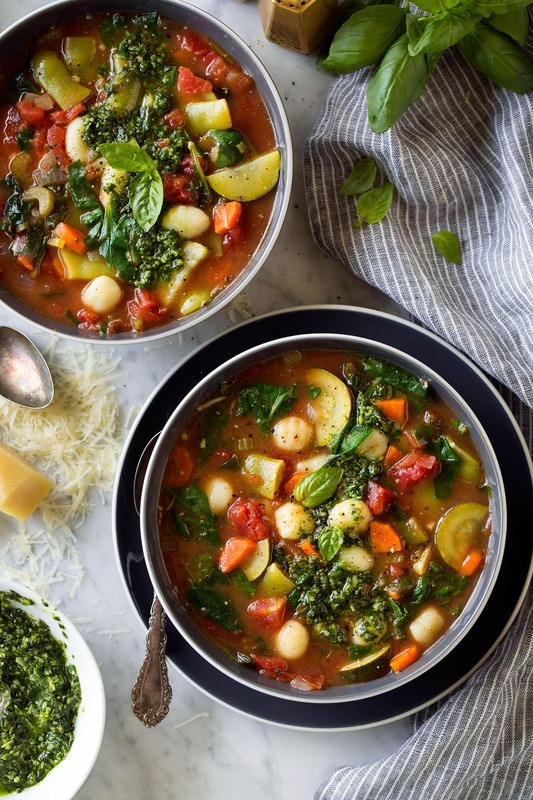 This soup is packed with nutritious veggies, it’s super tasty thanks to that fresh pesto, plus it’s easy to make. So in other words all around dinner win! I’m craving it all over again just looking at it! 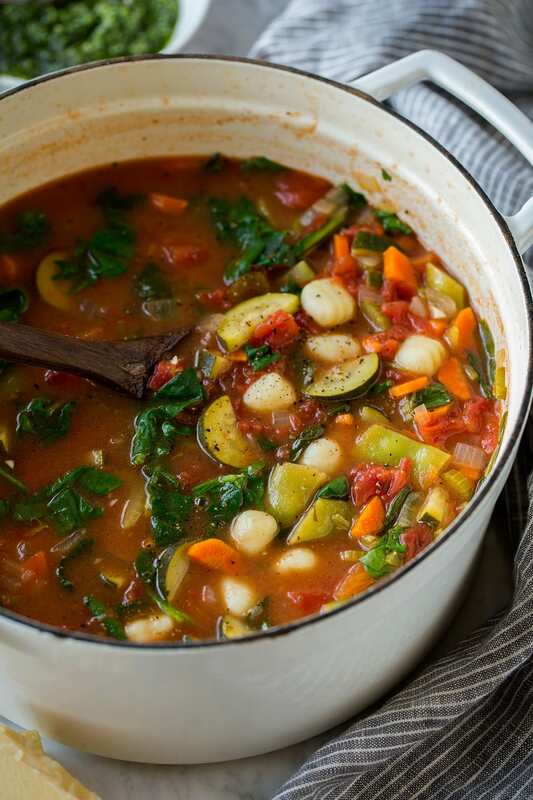 To give you an idea of taste, just think about your favorite minestrone then adding fresh pesto and gnocchi to that. I mean why didn’t I think of this before! Upgrade upon upgrade to one of my favorite kinds of soup! 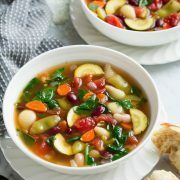 I’m totally a minestrone and vegetable soup lover. Heat olive oil in a large pot over medium heat. Add onion, carrots, and celery and saute 7 minutes, add garlic and saute 2 more. Add chicken broth, tomatoes, green beans, thyme and season with salt and pepper to taste. Bring to a boil over medium-high heat. Then add in zucchini, reduce heat to medium low, cover and simmer until veggies are almost fully tender, about 12 – 15 minutes. Stir in gnocchi, cover and simmer until gnocchi are tender, about 4 minutes. Stir in spinach and let wilt, about 1 minute. Prep pesto in food processor while soup is cooking. Serve warm with parmesan and pesto over each serving. I have to find ways to make vegetable soup super tasty otherwise my husband could care less because he’s not a vegetable soup kind of guy. He’s a big time meat eater but if I can make it taste good enough and make it hearty enough he’s willing to happily skip the meat. (You know without stopping buy a local burger shop after dinner). One of my kids has gone through that “EWWWW what’s that gross green stuff?” phase and still is a little but we always get through it with the reminder of no dessert after dinner :). Speaking of I’ve been making healthy desserts lately, can you believe it?? But I’ve actually been enjoying them. I’ll have to share a recipe or two soon! 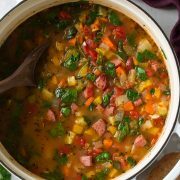 I hope you are staying warm and cozy and enjoying the new year, and of course I hope you love this soup! Good food makes life so much more enjoyable. Or maybe that’s just me because I care about food waaaaay too much :). 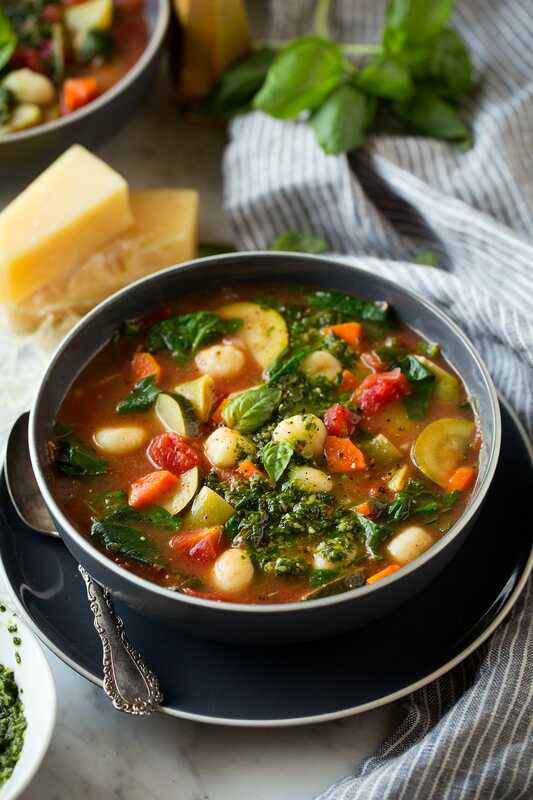 A hearty minestrone style soup with an upgrade of gnocchi and homemade pesto, in other words it's perfectly delicious! Just what you need on a cold winter day - or even a warm summer day when you have an abundance of fresh summer produce to use up. Bring to a boil over medium-high heat. Then add in zucchini, reduce heat to medium low, cover and simmer until veggies are almost fully tender, about 12 - 15 minutes. In a food processor pulse basil, parmesan, garlic and salt to taste until well minced. With processor running pour in olive oil. Brittany: I love all your recipes, everything is always so delicious!! Is there any chance you could make or add to your list Creamy Baked Potato Soup. 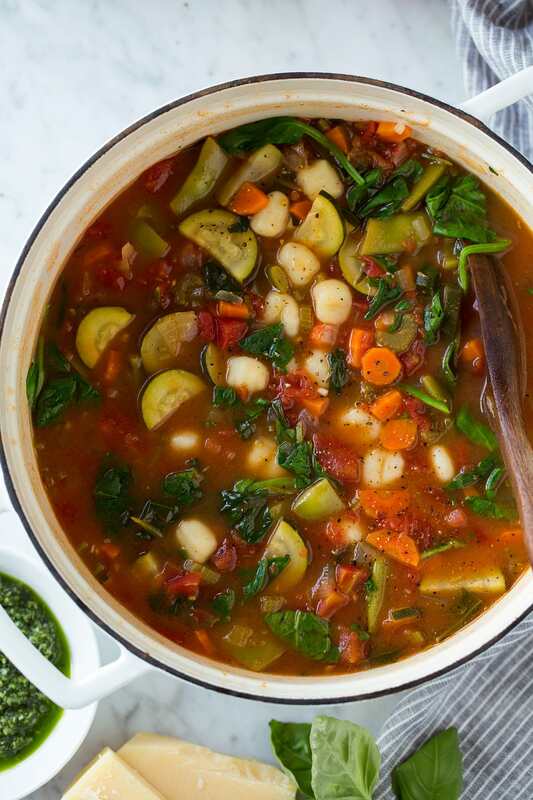 That’s my favorite soup and I know if you made it then it would be my go to recipe for it! !